KNM-WT-40000 is a relatively complete cranium that is highly distorted due to post-mortem compression and expansion, but still preserves some features similar to the Australopithecus condition1. Based on preserved teeth and molar roots, the upper molar size was small, and the teeth had thick enamel. The cranium has a tall malar region, and exhibits relatively moderate post-obital constriction. 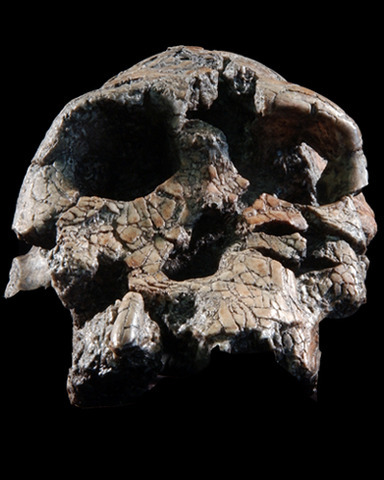 Although the cranial capacity is difficult to accurately assess because of the specimen’s distortion, it is believed that KNM-WT-40000 has a cranial capacity that falls within the range of cranial capacities of the australopiths1. Despite its similarity with Australopithecus, many derived facial features which distinguish KNM-WT 40000 from australopiths, are also present.